Annie Nations, an indomitable Appalachian widow of 79, lives on her mountain farm with the acerbic ghost of her husband Hector. Her tranquility is threatened by a brash real estate developer who wants to turn her land into a vacation resort and by concern over her son Dillard, a country singer who has come home with two stranded children because his wife has run away. Annie’s battle to decide her future takes her through some funny, touching, and magical flashbacks to her life with Hector. 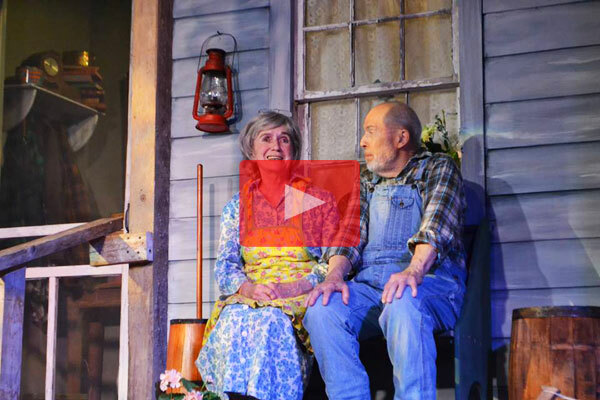 Played on Broadway by Hume Cronyn and Jessica Tandy, this couple offers a staunchly affirmative tribute to men and women of the country and their bond to the land of their fathers. Athletes and dancers are in their prime in their teens and twenties. By 30 they’re over the hill. Even the business world focuses on the talents of technically savvy millennials. But unlike other disciplines, the theatre offers unique opportunities for actors at any stage of life. At 81, Oscar-winning actress Glenda Jackson has just returned to a starring role on Broadway. Donald Sutherland, a mere 82, takes on J. Paul Getty in the new TV series Trust. At 88 years young, Christopher Plummer it seems will never stop taking on challenges. And Estelle Parsons, now an incredibly youthful 90, put in a appearance in the revival of Roseanne. 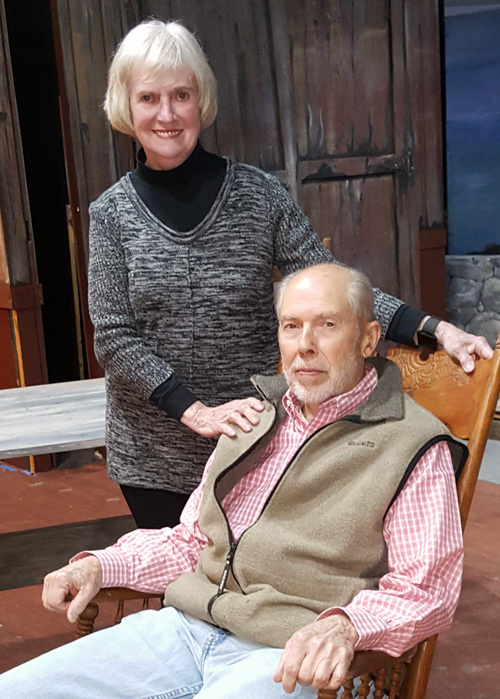 Reedville residents Sharon Robertson (79) and Robert Wilson (80) are treasured seasoned actors at the Westmoreland Players. Audiences at the Callao theatre have been privileged to enjoy their talents in dozens of performances over the last couple of decades. Currently Sharon and Bob take on the two leading roles of husband and wife in Foxfire by Susan Cooper and Hume Cronyn. It’s the heartwarming story of a woman living on an isolated mountain top in the Appalachians. The character of Annie wrestles with the choice of staying put or leaving for her own good and that of her family. Without a doubt, both actors face new challenges in performing. However, unlike many who bring their personal dramas to rehearsal, these two never complain. They are always early to rehearsals and well prepared. Bob‘s theatrical debut was a bit later in life. “My high school speech teacher started a Drama Club. Our one-act play was selected to go to the state drama contest, but trip was cancelled because of a snow storm. Our teacher wrangled an invitation for us to do a guest performance in Louisville…and to take a side trip the show Tea and Sympathy with Deborah Kerr. It was the first professional show any of us had ever seen. Afterwards we went backstage. On the ride home, I told my teacher that I bet I could do that,” recalls Bob. “I would have liked to play Willy Loman in Death of a Salesman, but I’m not disappointed it didn’t happen,” Bob states. But who knows what iconic role is still in this actor’s future. Bob offers this thought to the younger generation. “My advice to any young person, not just those that would like to be actors, is get involved with a school or local theatre company. By volunteering to work on a show in any capacity, young people learn skills that will serve them well wherever their lives take them. Taking responsibility for your part in making any project succeed, listening and being aware of what is happening around you, and understanding that you are one cog in a larger enterprise,” is what it’s all about. “Children are not afraid to pretend and that is what we do when we act,” Sharon remarks with a smile, “be a child again.” Now how many opportunities in life can offer you that miracle. Join these two gems and the rest of the wonderful cast of the family drama, Foxfire, runningMay 5-20 at The Players, 16217 Richmond Rd., Callao. Call 529-9345 or visitwww.westmorelandplayers.org for reservations.